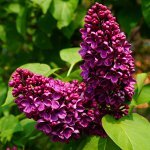 The Glorious Twenty-Fifth of May, also referred to as Wear the Lilac Day, is an annual celebration observed by fans of Terry Pratchett's Discworld series. Lately it has also become an impromptu Alzheimer's disease awareness day. Discworld is a series of comic fantasy novels written by the English author Terry Pratchett. The Glorious Twenty-Fifth of May is a remembrance day in the fictional Discworld that commemorates the People's Revolution, which put an end to Lord Winter's reign. On May 25, the survivors wear a spring of lilac and gather at the cemetery to honor those who fell during the Revolution. The Revolution is described in the novel Night Watch. The fictional celebration was adopted by fans of Terry Pratchett's works, who began to wear springs of lilac on May 25 to commemorate his writing. In 2007, Pratchett announced that he had Alzheimer's disease. His fans began the campaign Match It For Pratchett to raise awareness of Alzheimer's. Fans are encouraged to wear lilac in support of Pratchett and make donations to Alzheimer's research funds. The Glorious Twenty-Fifth of May coincides with two other fan holidays: Geek Pride Day and Towel Day. Sometimes Terry Pratchett's and Douglas Adams' fans celebrate the day together, referring to it as Wear a Lilac Towel Day.